In This Campaign, Clinton, Trump Flash Their Racial Credentials : Code Switch Experts call it "affiliative kinships" and the "opposite of othering;" whatever you call it, when race comes up in presidential race, the candidates feel the need to establish their racial cred. 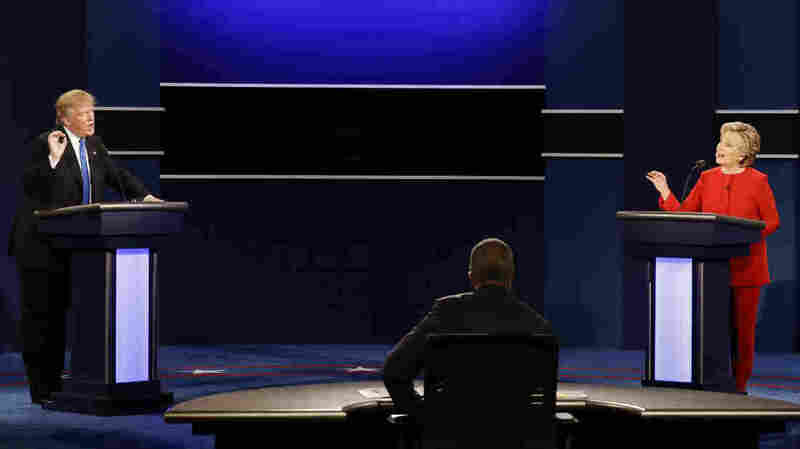 It was the first 2016 presidential debate between Hillary Clinton and Donald Trump, and NBC's Lester Holt was moderating. Holt's topic was how to "heal the divide" between the races, but the conversation had meandered from stop-and-frisk to no-fly lists to the Department of Justice's 1973 racial discrimination suit against Trump. When Clinton mentioned the discrimination lawsuit, Holt prompted Trump to respond. After veering further off topic, Trump did something you might call racial credentialing. "In Palm Beach, Florida ... a brilliant community, a wealthy community, probably the wealthiest community there is in the world, I opened a club," Trump said. "And really got great credit for it. No discrimination against African-Americans, against Muslims, against anybody." Trump's invocation of his Palm Beach club was his attempt to "inoculate himself from being called a racist," said Melanye Price, a political science professor at Rutgers University. We see this signaling — "Trust me, I'm ok on race" — from presidential candidates every election as they court people of color. Clinton has referred often to the time when she was 14 and met Martin Luther King, Jr., as well as to her participation in civil rights marches. On May 5 — Cinco de Mayo — Trump tweeted about taco bowls, saying, "I love Hispanics!" I asked a few experts for some terms for this play at establishing racial bona fides. The people I talked to liken it to someone saying, "Some of my best friends are black," or, "My wife is Mexican," before embarking on a questionable diatribe about African-Americans or Mexican-Americans. Often, people deploy these phrases to position themselves as "insiders," or to give themselves license to say something offensive, said Jennifer Lee, an expert on race and immigration at the University of California, Irvine. "For centuries, the African-American church has been the conscience of our country — so true. It's from the pews and pulpits and Christian teachings of black churches all across this land that the civil rights movement lifted up its soul and lifted up the soul of our nation." "She reacts this way when people le faltan el respeto ..."
"She isn't afraid to talk about the importance of el respeto (especially when it comes to women) ..."
Guillermo Grenier, a sociology professor at Florida International University, says this type of behavior could be an attempt for people — in this case, candidates — to simultaneously demonstrate empathy for and solicit empathy from folks. He calls it the "opposite of othering." "Sometimes [these appeals] come naturally," Grenier said, "but a lot of times it's something you want to portray because you want a group to see you not as the other." But as Price pointed out, it's not always about the "other." "White candidates do this as much (or more) for white voters as they do it for people of color," she told me. If a candidate is seen as racially offensive, then for reasons that should be obvious, "white voters don't want to see themselves as the candidates they choose." "The goal is straightforward: If Trump seems more normal and less erratic, then he could begin to win those white college-educated voters who are critical to victory in states like Colorado, Florida, North Carolina, and Pennsylvania. For Team Trump, it's a simple equation. If those voters are turned off by his racist rhetoric, then he could address their fears by loudly reaching out to black voters. It's an old strategy, meant to assure a critical set of Republican-leaning voters that they aren't backing a bigot." Lee described Clinton and Trump's actions as nodding to their "affiliative kinships" — a term she told me she'd just cobbled together. "They're trying to show that their actions prove that they care deeply about these communities, and have worked towards racial justice" on behalf of African-Americans, Latinos and other racial and ethnic minorities, she said. Call it racial inoculation, the "opposite of othering," or "affiliative kinships," but candidates who at least try to appeal across racial lines tend to do better with people of color. That, at least, is what Loren Collingwood, a professor at University of California, Riverside, thinks. "It's not automatic," Collingwood said in an email, "but if candidates think about it, work at it, throw resources at it, hire the right people, and their opponent does not do these things (or only pays lip service), that candidate will do much better with the groups to which they appeal."